I was a big fan of Jaden Hair’s Steamy Kitchen Blog long before she published her book. Her blog is just full of simple unpretentious Asian recipes with ingredients that can be found in regular groceries. I was so excited when I saw her book in my local library, because this way I can really check out the book before purchasing it. I had so many recipes tagged from her book that I am going to purchase my own copy. This recipe really caught my eye right away. I was never really a big beef eater until I met Red. But now, I really enjoy cooking beef like this recipe. Obviously, I didn’t grill this outdoor (with a single digit temperature outside), but it turned out fabulous on the pan as well. I think this sauce would be delicious with chicken: it is a bit tangy, sweet, with just enough saltiness. Red and I enjoyed ours with regular *ehm* American salad with croutons and all. But I know it will pair up well with steamed rice or mashed potatoes. I am definitely glad that I tried this recipe. This recipe is a keeper that I am sure that I will be making again before the summer arrives… **groan** That’s probably another four months for us in the Midwest. Happy cooking and eating! To make the Balsamic Teriyaki Sauce, add the butter to a saucepot and set over medium-low heat. When the butter just starts to bubble, add the shallots and garlic and cook for 3 minutes or until aromatic are soft. Watch to make sure that you don’t burn the shallots or garlic. Pour the balsamic vinegar in and bring to a boil. When boiling, immediately turn the heat to medium low and simmer; uncovered for 15 minutes or until reduced by half. The balsamic should be thick, glossy, and coat the back of a spoon. Add the sugar, stock, soy sauce, and mirin. Stir well and bring to a boil. When it reaches a boil, immediately turn the heat to low and let simmer for 5 minutes. Let cool and reserve 1/2 cup of the sauce for marinating and remaining 1/4 cup for serving. If you are marinating the steak before grilling it, place the steak and just 1/2 cup of sauce in a large sealable plastic bag. Marinate 2 hours or overnight in the refrigerator. Thirty minutes prior to grilling, remove steaks from refrigerator and let it sit at room temperature. Discard the marinade and pat the steak very dry. Grilling Outdoors. If you are grilling outdoors on your barbeque grill (preferred method), preheat the grill for direct grilling over high heat. Grilling in Pan or Stovetop. If you are cooking the steak on the stovetop, set a large frying pan or griddle over high heat. When a bead of water sizzles and evaporates upon contact, add the oil and swirl to coat. Add the steak to the hot grill or pan in one layer. The pieces should not be touching. Cook for 3 to 5 minutes on each side for medium-rare. 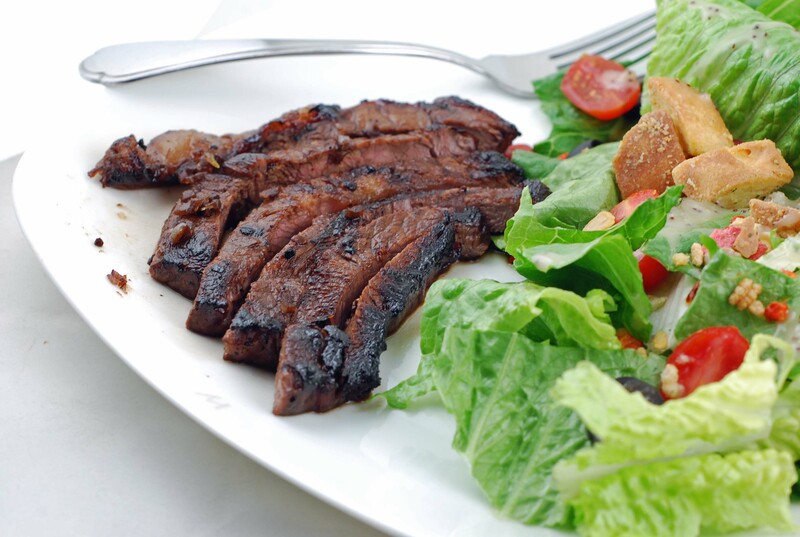 Skirt steak varies in thickness so you might want to add the thicker pieces to the grill or pan first and give them an extra minute of head start. Let the grilled steak rest for 5 minutes then cut ACROSS the grain for ultimate tenderness. Pour the remaining 1/4 cup of the Balsamic Teriyaki Sauce over the meat. After my successful experience with the slow cooker last week, making this delicious Classic Pot Roast, I was ready to try another recipe in my slow-cooker. I was browsing a lot of recipes in some of my favorite sites, and stumbled upon this Pepper Steak recipe on Allrecipes. I wanted a recipe that doesn’t involve too much cream in it, still light but hearty–two components that are hard to get in one dish. I tweaked this recipe a little bit to fit our taste. I used beef steak and cooked mine for about 6.5-7 hours. I really think that in the future, I can probably find a different type of meat that is a little bit less expensive. After all–that is the beauty of slow cooker, right? I threw in some Montreal Steak seasoning along with garlic powder while browning my sliced beef in the pan. I also reduced my soy sauce to 2 tablespoons instead of 3 and substituted it with Worcestershire sauce. Finally, I followed the advices from the comments on adding the sliced green pepper in the last 2 hrs of the cooking. I served this over a bed of cooked white rice. Not only that the house smelled so incredible when we walked into the house, this dish was delicious! Cover, and cook on High for 3 to 4 hours, or on Low for 7-8 hrs.